It is my belief that this John Philips spelled his name with one "L". His name appears on occasion spelled with two "L"s, however it is easy to make such a mistake. Phillips is normally spelled with two "L"s. I myself do it from time to time. In the inventory of his estate his name is spelled with one "L" at the top and with two "L"s at the bottom. However, most of the time documents relating to this John Philips spell his name with one "L", including the book "Southside Virginia Families" by noted historian John Bennett Boddie. John Philips, born circa 1698, mentioned in the will of his grandfather Mathew Swann in 1702. On 2-19-1719 he purchased 265 acres on the Main Swamp of Lawnes Creek from Lovelace Savidge. (Surry B.1715-255). His will was dated 8-11-1758 and probated the following year. He devised his land in Southampton and on the "Bold Bobbin" Branch in the county of Surry to son Hartwell who appears to have been the youngest. Son Hartwell and kinsman Carter Crafford were appointed executors. Only daughter Mary Warren was married when the will was made but the final division of his estate 1-19-1762 among the heirs suggests the names of his other sons-jn-law. The estate was divided among the heirs Arthur Philips; Joseph Philips, Hartwell Philips, Allen Warren, Moses Bennett, Joshua Wood, Joshua Proctor and Micajah Exum. The wife of John Philips is uncertain. Hannah, daughter of John Fort of Surry was married to a John Philips in 1721. (S.V.F. -196). Martha, the youngest daughter of Robert Crafford of Surry married a Philips and a similarity of names suggests that it might have been this particular John Philips. (V. H. G. -296). John Philips, of course, may have married twice. I. John Philips - untraced. II. Joseph Philips, m. Sarah Exum. See later. IV. Hartwell Philips m. (1) Jane Hancock; (2) Feraby Jones. V. Elizabeth Philips - untraced. VI. Lucy Philips - untraced. VII. Ann Philips - untraced. VIII. Sarah Philips - untraced. IX. Mary Philips m. Allen Warren III of Surry County, Va. In Volume 2, p.3, Surry County Deeds, Allen Warren conveyed to his step-father John Little, his lands in "Philips Pocoson". Allen Warren III was the son of Allen Warren Jr., and his' wife Anne Hart. 1. William Warren, died 1804. The above Southside Virginia Families book says that John Philips Jr. is untraced, however I located his Will in Edgecombe County NC with his executors named as Etheldred Philips, the son of his brother Joseph, and Exum Philips, the son of Etheldred Philips. This pretty well establishes that he is the John Philips listed as the son of John Philips Sr. in the Southside Virginia Families book. Since he is the oldest of the children, he was likely already established and did not need an inheritance. He was only left a feather bed and furniture and ten pounds of money. Joseph, Arthur, and Hartwell, all left Virginia about 1750 for the Swift Creek area above Tarboro NC. Likely John left at the same time. Following is the Surry County VA 11 August 1758 will record of John Philips. I give to my Son John a Feather Bed and Furniture and Ten pounds Current Money. The will of John Philips was filed on 11 August 1758 in Surry County VA as stated above and his name appears as Phillips with two "L"s as shown above. The will appears to be signed with "His Mark", so apparently he didn't sign the will with his signiture for some reason. Even more interesting is the inventory of the effects of John Philips which copy I also have. It was filed on 20 February 1759. At the top it says "Inventory of the Estate of John Philips", with one "L", while at the bottom it says "The aforementions inventory of John Phllips deceased....", with two "L"s. Seems like quite a causal way to do business if you ask me. Then on 19 March 1762 Carter Crafford filed an account current for the estate of John Philips and spelled his name at the top of the document and at the bottom of the document with Philips spelled with one "L", making me believe that he actually was known as Philips, spelled with one "L". The bottom of the same document is shown below. 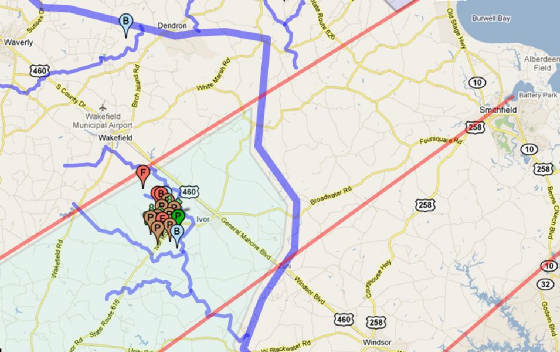 The below maps show where I believe the Philips owned land and lived in Virginia prior to moving to Edgecombe County NC after 1850. The map below is a larger view of the above map and shows the approximate locations of land held by this Philips family. Click on the map below to open the Google interactive map showing the view below. You can click on any icon or line on the interactive map and a box will pop up giving details about what the line or icon represents. You can also zoom or pan around the Google interactive map. John Philips, shown on the original patent spelled with one "L", was granted on 28 August 1746 320 acres on the South side of the main Blackwater. Beg.g &c. in Etheldred Taylor’s line. This appears to be the same land that was given to Hartwell Philips by his father John Philips in his will above: " give to my Son HARTWELL my Plantation in Southampton County containing Three hundred and Twenty Acres". John went on to give Hartwell "the land where I now dwell". The 320 acres is in Southampton County VA and the will is filed in Surry County so we can assume John was living in Surry County. Perhaps he was living on the land he received in the following patent. John Philips, shown on the original patent spelled with one "L", was granted on 10 January 1735 135 acres on the North side of the Cypress branch adjoining land of Edward Long and John Philips. The land is near where in 1695 John Fort purchased 300 acres and also near where William Phillips, spelled with two "L"s lived when he died. It's also located in Surry County VA.
John Philips, shown on the original patent spelled with one "L", was granted on 29 August 1757 120 acres on the South side of Seacock swamp. Beg.g &c. by the side of said swamp, adjoining the land of Bartholemew Andrews, John Portis &c.
Joseph Philips, spelled with one "L", on 10 July 1745 was granted 540 acres near the location of John Philips, spelled with one "L" grant above. Joseph was also granted on 10 July 1755 92 acres nearby. It seems logical that this Joseph Philips is the son of the above John Philips/Phillips and the one who was born 16 November 1726. 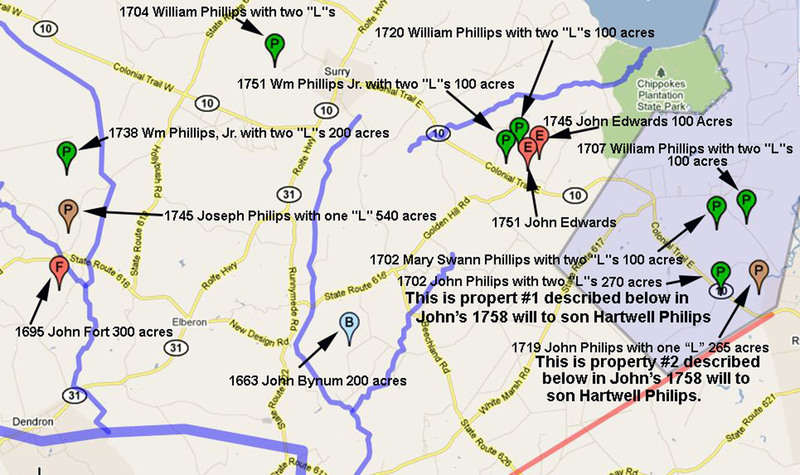 John Philips' 1758 will left three properties to his son Hartwell, who according to the Boddie Southside Virginia Families book was the youngest son. John's other three sons, Joseph, Mathew, and Arthur are not mentioned in the will. The above maps show the location of the three properties that Hartwell inherited from his father John Philips as well as the location of other properties of interest in Surry and Southhampton Counties VA.
A John Phillips, spelled with two "L"s, purchased 270 acres in Surry County VA from Charles Savage in 1702. Since this John Philips was born about 1698 he would have only been three years old in 1792. It must have been another John Phillips, perhaps his uncle, who purchased this property and then either willed, gifted, or otherwise deeded the property to this John Philips. Surry County Virginia Deed microfilm copy obtained from the Library of VA. Click to see a copy of the deed. This deed was recorded in a reference as being 220 acres, but the original deed above is for 270 acres. The writing on the deed is such that it would be easy to think it was for 220 acres. A John Phillips, with two "L"s, is shown in the 1704 Surry County VA Quit Rent list as owning 270 acres which agrees with this deed. Surry County Quit Rent from Quit Rents of Virginia 1704 by Annie Laurie Wright Smith. The record is clear that Hartwell Phillips, spelled with two "L"s, sold this same land after he went to NC. HARTWELL PHILLIPS and wife Jane Phillips of Edgecomb Co. in North Carolina to Anthony Digge of Surry County for 30 pounds current money-270 acres bounded by a former corner of Samuel Thompson and Nicholas Sessoms and a branch formerly between Charles Savage and Joseph Richardson. This property is most likey part of a patent obtained by Charles Savage on 20 April 1682 in Surry Couty described as: 570 acres on the Blackwater branches, in the lower parish. Beginning and extending a corner tree betwuxt Major Marriotts land now in possession of Samuel Thompson and Nicholas Sessums. This locates the land in the same general area as the 265 acres where John Philips/Phillips was living at the time of his death as described below. This seems to be the same 265 acres described in the following deed from Loveless Savidge to John Phillips, with two "L"s, in 1719. From the Boddie book we learn that it is located on the main swamp of Lawnes Creek in the County of Surry. pg. 255 16 Feb 1719 Loveless Savidge Planter of Surry CO [Indenture also signed by wife, Sarah Savidge], to JOHN PHILLIPSs... 265 acres near a parcel surveyed for Charles Savidge and bounded by Mr. Samuel Thompson , This Land being formerly granted to Robert Savidge on 20 Apr 1682 and being given by will of sd Robert Savage to sd Loveless Savidge. Apparently when he died, John Philips was living on the 320 acre patent he obtained on 28 August 1746. It is described in the patent as 320 acres on the South side of the main Blackwater. Beg.g &c. in Etheldred Taylor’s line and adjoining John Branch. John Branch received a 100 acre patent on 5 Sep 1723 described as follows: 100 acres on the south side of the Lightwood Swamp. Etheldred Taylor received a 545 acre patent on 16 June 1714 described as follows: 545 acres beg.g at the mouth of the Concord branch on the So. Wt. side of the Lightwood Swamp. We can see that John Philips owned property south of the Lightwood Swamp. Where John Fort and Joseph Philips, with one "L" had received grants. Rex Phillips, a Phillips reseacher, presents the argument that John Philips who wrote his will in 1758 in Surry County VA could not have purchased the 270 acres in 1702 that he left to his son Hartwell as he would have been too young. Let's examine what we know about the time-line for John and his children. We know that John's son Joseph was born 16 Nov 1726 based on the book Southside Virginia Families, Volume 2, By John Bennett Boddie. The book further states that Joseph married Sarah Exum on 19 Jan 1759, when Joseph was 34 years old. Together they had 7 children. Joseph's will was dated 6 Nov 1779 when he would have been 52 (almost 53) years old. That's 19 years between his marriage and death to have 7 children. Let's assume that John was 21 when he purchased the 270 acres in 1702. Therefore he would have been born in 1681. That would make him 77 when he wrote his will, a possibility. If he waited until he was 34 to marry as his son Joseph did, he would have married in 1715 and had has first child in 1716. If his youngest child was 17 when he wrote his will he would have 60 when that child was born. He would have had 41 years to have 10 children. So it's quite possible for this John Philips to be both the son of William Philips who wrote his will in 1758 and my ancestor. However, it seems that it is more likely that this John Philips was born about 1698 and married about 1720, with his son Joseph being born in 1726 (according to the Boddie book) soon after John Philips married. Probably John, Jr. was the first born and maybe Arthur next, then Joseph. That would have made John Philips 21 when he purchased 265 acres in 1719. We know that in 1758 Hartwell inherited the property from his father, John Phillips.. However, we don't know which John Phillips purchased the property in 1702. It is entirely possible that another John Phillips purchased the property and either willed it or sold it or gifted it to Hartwell's father sometime between 1702 and 1758. Rex Phillips says that he and other researchers have been unable to locate any record of this property changing hands between 1702 and 1758, but that's not unusual as these are old and imperfect records. In any case, the absense of a record of land transfer is not proof the transfer didn't take place. There were more than one John Philips/Phillips in Surry County VA between 1702 and 1758 as evidenced by the records below. Any of them could have been the one who made the above purchase of 270 acres in 1702. From the following reference we know that a John Phillips, spelled with two “L”s, owned 150 acres in the Lawnes Creek area about 1736. However without seeing the original record there’s no way to know if the spelling is correct. Mathew Swann's 1702 will points to a John Phillips who is the son of his daughter Mary's husband, Williams Phillips. There is no indication what John's age is, but William wrote his will in 1721. 14 Dec 1702 Will of Matthew Swann:. To daughter Mary, wife of William Phillips, and to grandson John Phillips, my house and plantation where I now live. To daughter Sarah, all the remainder of my land adjoining Mary, when 18 years old. Wit: Ar: Allen, Jno Allen, Robt. Ruffin. Apparently there was another John Phillips, with two “L”s, who died about 1749 in Surry County VA according to the following reference. This John Phillips, spelled with two "L"s, was born about 1632 and would have been about 70 years old in 1702. Following is a list of wills from the index of VA wills and administration at the Library of VA.
Part of index to wills not listed in Virginia Wills and Administrations, 1632-1800 (Torrence). Surry Co. D. W. Etc. 4, 1687-1694, p. 185[b]. Surry Co. Deeds, Wills, Etc. 10, 1754-68, p. 183-184.
p. 245-246. Will pro. 14. Feb. 1779. P. 275. Inv. rec. 10 June 1779.